A beautifully wrapped gift is as delightful to give as it is to receive. This kit has it all: how to create striking gift packages with artful wrap and unique embellishments. 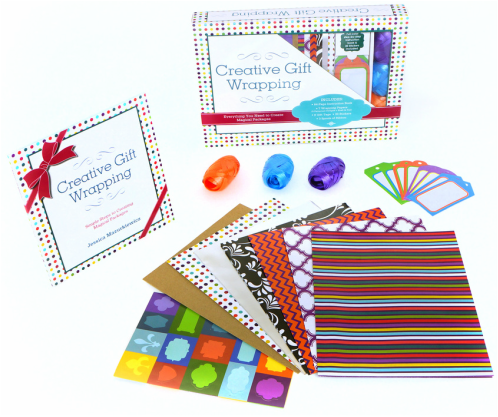 With Creative Gift Wrapping, you get gorgeous wrapping papers, ribbons and tags, together with a full-color book filled with ideas and tips for creating elegant, one-of-a-kind packages—from two-toned wrapping and pinwheel bows to gift towers and custom gift tags. Jessica Mazurkiewicz is a freelance illustrator and frequent gift giver. From her home studio in Vermont, Jess creates work for a wide variety of clients. In addition to illustrating numerous coloring & activity books, her artwork has also been used as editorial illustrations, book covers, decals, dinnerware, glassware, home textiles and beauty products.